What to expect: Treats for the eye and rest for the weary is the theme at this architecturally dazzling resort. The children's pool is well away from other pools, ensuring family fun in one spot and tranquility elsewhere. 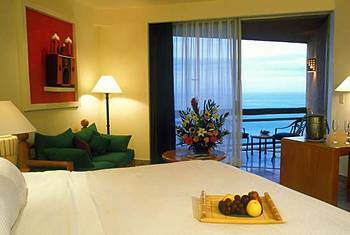 Partial Ocean View - One king bed or two double beds (Westin's signature Heavenly Beds). Obstructed partial view of the ocean. Private balcony with patio furniture. Located on lower floors. Sitting area and in-room safe. Bathroom with separate tub and shower. Ocean View - Private balcony overlooking the Sea of Cortez. Sitting area with coffee table. 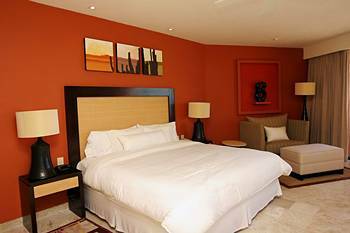 Westin's signature Heavenly beds - one king or two doubles. Bathrooms with walk-in showers, separate bath, hair dryer and exclusive toiletries. 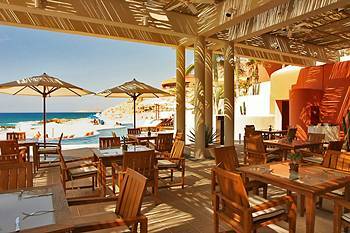 Royal Beach Club - Private balcony overlooking the Sea of Cortez. Sitting area with coffee table. Bathrooms with walk-in showers, separate bath, hair dryer and exclusive toiletries. 400 sq. ft. with one king or two double beds (Westin's signature Heavenly Beds). Access to Royal Beach Club lounge, serving daily Continental breakfast and cocktails with hot and cold appetizers each evening. Shuttle vans or private cars of varying prices are available. They can be selected during the process of booking a reservation for this hotel and added to the total trip cost. La Cascada - The resort's main restaurant serves breakfast, lunch, and dinner, with à la carte choices at all meals, a buffet at breakfast, and theme buffets available at dinner. Both air-conditioned and terrace seating is available, and there's occasional live music. El Set - Another all-day, à la carte restaurant offering breakfast and dinner buffets as well, this place features Mexican cuisine, seafood, and steak at dinner. Arrecifes - Spectacularly situated on the beach, this open-air restaurant serves an international menu at night accompanied by piano music, and includes the On the Rocks Bar. La Playa - Sun and shade terraces, neighborly pelicans, and a menu of seafood, Mexican specialties, sandwiches, and salads draw guests from mid-morning until late afternoon. La Cantina - A contemporary version of the traditional cantina, this sports bar is open from early evening until late evening. Arrecifes - Situated on a hill overlooking the Sea of Cortez and serves regional and international cuisine for dinner only. Live entertainment is provided. Asian Corner - Located in one corner of Arrecifes Restaurant, guests can enjoy favorite Asian specialties including a sushi bar. Live entertainmen. Open from early evening until late evening. La Palapa Bar - Casual dining. Bar menu available. Open from mid-morning until late afternoon. Margaritas Bar - Poolside bar. Open from mid-morning until early evening. Room Service - Available 24 hours. 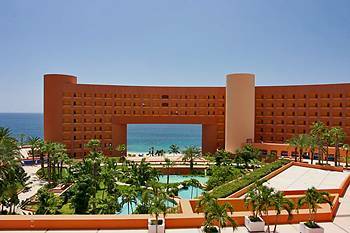 The resort contains seven pools, with the main complex consisting of terraces with curved white walls, palm trees, and cactus gardens interspersed with pools (one for children), a 12-person spa, and a swimup bar. Padded lounges provide sunbathing comfort. 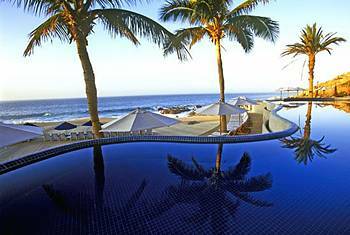 Farther along the beach are two quiet pools overlooking the beach, and another pool is secluded on the mountainside. The beach is long and broad, but safe swimming days are few due to strong undercurrents. A health-and-beauty spa offers numerous different massages in private treatment rooms or otdoor cabanas, beauty treatments, Swiss and Vichy showers, and hair and nail care, and includes a fully equipped fitness center and men's and women's saunas and steam rooms. Sport-fishing, whale watching, and many other sports and activities are available in the area.